The Mexican Wolf (Canis lupus baileyi) is a subspecies of Gray Wolf, but it is the most genetically distinct subspecies. Mexican Wolves are the smallest type of Gray Wolf in North America, growing almost 5 feet (1.5 meters) in body length and weighing about 82 pounds (37 Kg). This makes them about the size of a German Shepherd. Historically, the Mexican Wolf could have been found in the Chihuahuan and Sonoran Deserts, Central Mexico, Texas, and as far north as Colorado. By the early 1900s, the populations of the Mexican Wolf's natural prey, elk and deer had been so over-hunted that the wolves began to kill and eat livestock. This made them the target of ranchers and farmers. They were not even safe when hunting deer and elk, because human hunters of those animals would kill the wolves to eliminate competition for game. The effort to exterminate the Mexican Wolf extended beyond individuals, because even government agencies had targeted them. By the 1950s, they were - in a sense - successful, because the Mexican Wolf had been completely eradicated from the wild, and they only remaining wolves lived in captivity. They were declared endangered in 1976 and have remained so ever since, even with breeding and reintroduction programs in progress. Today there exist only 340 Mexican Wolves, in 49 different facilities in the United States and Mexico. 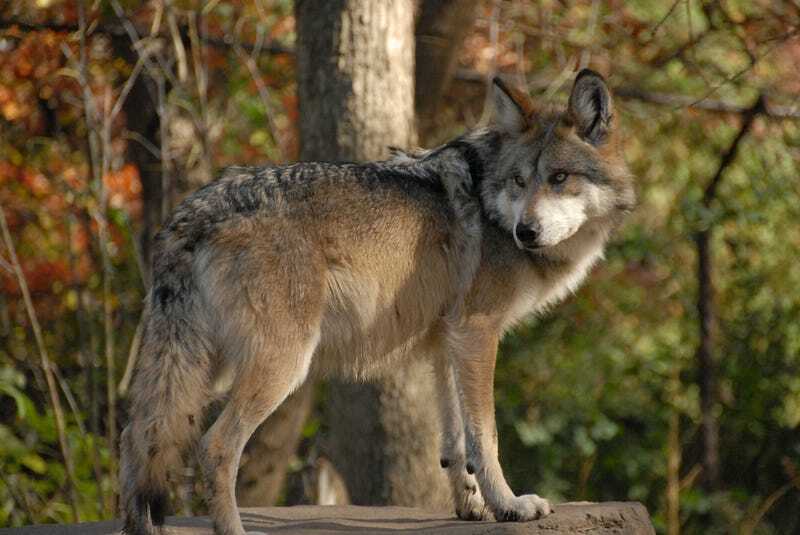 The largest facility conducting a breeding program for Mexican Wolves is the Endangered Wolf Center in Missouri, and has been accredited by the Association of Zoos and Aquariums, and is a founding member of the AZA's Species Survival Plans for the Mexican Wolf and the Red Wolf. Re-introduction efforts for wolves, Mexican Wolves included, are usually met with resistance from the governing agencies that have jurisdiction over the land the wolves are meant to occupy - and though hunting wolves is still illegal in many areas, wolves are shot illegally anyway.